Chiang Mai Creative City, an initiative to put in place the foundations, people, connections, marketing and infrastructure to develop Chiang Mai as a world-class centre of creativity and innovation is announcing a logo and website design competition. Open to students and citizens, prizes will be awarded for the winning entries. The initial focus in on the IT sector, as both an key industry in itself and an enabler of creativity in other sectors and is a collaboration between tertiary education institutes and the private sector and is in line with the Thai Government’s vision to develop the creative economy within the country. 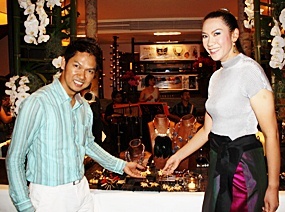 The atmosphere at the Tamarind Village on the evening of August 6th, was once again buzzing, this time over a fine collection of jewelry from up and coming Thai designers. Entering into the softly lit courtyard of the Tamarind Village, my eyes are immediately drawn to the Lanna lanterns floating in the pool. Ahead in the central pavilion is a wondrous, shimmering display. The guests are all abuzz, admiring the dazzling jewelry. The ladies, with their elegant dresses in jeweled tones, reflect the mood of the evening. Pakin Ployphicha of Oasis Spa and Anchalee Kalmapijit of Elephant Life Experience view some of the unique and beautiful jewelry on show at the Tamarind Village. The showcase featured unique contemporary designs inspired by nature, organic forms, and textiles. Respected designers; Saprang, Caso, Flow, Mono, Fontips and Aztique, have been brought together for the first time in Chiang Mai through this exhibition, with up and coming designers Pilantha and Neeranuj Wongwasin, whose unique works are truly breathtaking. I had the pleasure of speaking with the fresh-faced Neeranuj Wongwasin, 24, an up and coming designer. She started out with a Fashion Design degree and spent 3 months as an intern at Elle Magazine. Along the way, she began to realize that the unique jewelry—evocative of northern Thai tribal dress— she was creating for herself was drawing some serious attention, initially from friends and then stylists and designers. And just like that, she had discovered an exclusive niche for herself! Her collection within this exhibition has been designed and created exclusively for Tamarind Village and are one of a kind unique pieces. Neeranuj’s jewelry designs are statement pieces, which are sure to also be conversational pieces for they are striking and unique. Surprising too, is that Neeranuj’s designs, and the designs in the exhibition, are available for sale at extremely reasonable prices. The exhibition is open to the public on August 7th and will run through November 30th, 2010.